Do you know the Hinamatsuri? Hina Matsuri (Doll Festival) takes place on March 3 and celebrates "Girls' Day". Most families with girls display "hina-ningyo" (special dolls for Hinamatsuri) They are usually arranged on a five or seven-tiered stand covered with a red carpet. This is the day families pray for the happiness and prosperity of their girls and to help ensure that they grow up healthy and beautiful. The celebration takes place both inside the home and at the seashore. Both parts are meant to ward off evil spirits from girls. These pics are our hina dolls at our lobby and dinning room. I like this winter event ! End of March SAKURA start to bloom and the light up the temple with beautiful SAKURA is very beautiful. From Shoren-in Temple in the north, past Yasaka Shrine, to Kiyomizu Temple in the south, 4.6km of walking paths will be adorned with ground lanterns and ikebana artwork are lit up. During this time there will be various events, with traditional arts on a special stage. The surrounding temples and shrines will hold special viewings and illumination events. What is Hanatoro“Elegance” and “sophistication” are the words of the day as the Kyoto night sky lights up with hanatoro. 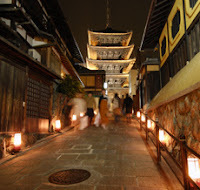 Kyoto’s famous temple, shrines, historical and cultural heritage sites and facilities, and streets are adorned with ground lanterns and ikebana artwork are lit up. During this time there will also be traditional arts performances, Japanese traditional music concerts, and art exhibitions featuring Kyoto art students. you can walk to there from our hotel. I went to make Wagashi(Japanese confectionery) at japanese sweets shop. Wagashi are often served with japanese green tea. most wagashi is made by Mochi , red bean past and some fruits.the coulor and shape are very beautiful and cute. we went to the shop there are no people there so only 2 of us could learn how to make Wagashi. It was not difficult to make it.we only make a shape and knead red bean paste and after we made own wagashi we could enjoy wagashi and japanese green tea. it was great experience to make japanese sweets by my self and enjoy them. This is the website for japanese sweets shop. the shop name is Kanshundo and you need to make a reservation . we are in down town It is very convenience . but we are not on the main street so its very quiet but also sometimes difficult to find us. so I would like to show you how to get here . from Kyoto station (central station of kyoto) you can take taxi or subway. by taxi will takes about 15minutes to 20 minutes. by subway also will takes about 15minutes Please take subway "Karasuma Line" (for Kokusaikaikan) to Karasumaoike Station(K08), which is 3rd stop,and transfer to "Tozai Line" (for Rokujizou or Hamaotsu) to Kyotoshiyakusyo-mae Station(T12), which is 1st stop.Please walk through Zest Oike (the underground shopping area), get up on the ground from the exit 10 and walk about 2 blocks to the north on Gokomachi St.
on the Gokomachi St you will see sign for Hotel Nishiyama but this sign is in japanese . This is Exit 10 and The sign of Hotel nishiyama on the Gokoumachi St. This is February Kaiseki dinner at our hotel ! we serve this picture dishes and rice, miso sourp and dessert. I found nice weblog to know Maiko and Geisha life! even I grow up in Kyoto I do not have many chance to see them and their life style is mysterious but on this weblog you can know their mysterious life and this weblog was written by real Maiko and in ENGLISH!!! We are going to have Japanese tea ceremony on 23rd of February. the teacher speaks English and our guests are 99% non japanese so you do not worry anything about the language . we hope many of our guests can join us and enjoy japanese culture!!! I would like to introduce popular place for japanese tourist in Kyoto. There are a lot of temples and shrines in kyoto but we also have another famous spot . kyoto has many cafe Left picture coffee shop is one of famous coffee shop in kyoto. this coffee is very nice and many people go there for breakfast. (Location) on the corner of sanjostreet and fuyachou street. Right picture is at Yojiya cafe. this shop is very very famous for cosmetic.Japanese tourist buy cosmetic for kyoto souvenir . but this cafe also very nice and cappuccino is very cute. (Location) On the corner of sakaimachi street and sanjo street. ou can get many of kyoto food there. This market also 15minute by walk from our hotel. Ponto cho is one of very famous restaurant street.this street is very narrow but vey tradditional and almost restaurant is very nice. you shold go there and find a nice restaurant for dinner. 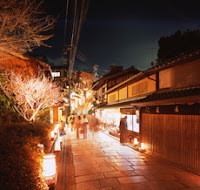 This picture is famous noodle restaurant and the home shop is in Kyoto. I had ever watch this noodle restaurant on TV but one of our Hawaiian guest she told me this restaurant is very nice and this shop is also in NY !! the noodle was very simple but very delicious. this restaurant is on Shijo street and kiyamachi street near Ponto cho. Today I introduce some famous spot for japanese tourist but kyoto still has many interesting and nice restaurant or shops and Our hotel is very close from down town so this is very convenience to go almost famous spot. Byoudouin open from 8:30 to 17:30 entrance fee is 600yen per person. this temple used to use for villa of japanese aristocrat and after the year 1052 Byoudouin was rebuiled for temple. 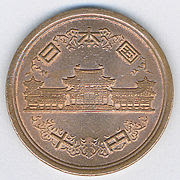 Byoudouin is pictured of japanese 10yen coin and the building was really beautiful. inside of Byoudouin there are beautiful modern museun building and garden so I could just sit down there and enjoy the garden . after the byoudouin we walk to the Ujigami shrine this shrine is one of the world culturel heritage so the building is very old andvery histrical atmosphere . the entrance fee is 500yen per person and it is open from 9:00 to 17:00. Uji is small city but there are many famous temple there , food and seets are also very nice. there are not so far from kyoto city. this year is ceremony for Tale of Genji ! I am sure you can enjoy Uji ! UJI is One of my favorite place in kyoto. Uji has some very famous temple. one is Byoudouin this temple is pictured of japanese 10yen coin and Uji is also famous for green tea and the tale of Genji . Do you ever heard about the Tale of Genji (源氏物語, Genji Monogatari) ? This is a classic work of Japanese literature attributed to the Japanese noblewoman Murasaki shikibu in the early eleventh century, around the peak of the Heian period. It is sometimes called the world's first novel , the first modern novel, or the first novel to still be considered a classic. The issue remains debated among readers. This year is anniversary of Genji monogatari and we would like to introduce model tour of UJI. Took Keihan line and change at the Chushojima station and get off the train at Uji station. Total will takes about 45minutes. Uji is small city so almost famous tourist attraction you can walk. you can try japanese green tea , green tea ice cream!! !